Located in the heart of Europe, Switzerland is a landlocked and mountainous country, the beauty of which will bewitch your senses. Mountains instead of meetings, wildlife instead of Wi-Fi, cabins instead of computers: follow the call in your heart and head back to nature for a honeymoon experience which will be unforgettable! Glorious hikes, thrilling bike trails and enchanting canoe routes promise an unforgettable adventurous honeymoon. For the romantics, stunning vistas, beautiful landscapes and charming towns will make your honeymoon truly memorable. It is not without a reason that Switzerland is one of the best honeymoon destinations. 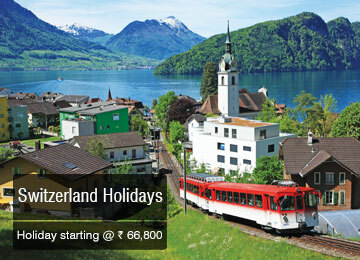 A honeymoon in Switzerland will be truly unforgettable with Switzerland honeymoon packages. Make your honeymoon memorable by marvelling at the beauty of the Swiss Alps, gaping at Matterhorn, feeling on top of the world at Jungfraujoch or spending wonderful moments of togetherness at Interlaken. For more information on Switzerland honeymoon packages, SOTC can be your travel guide. About two-third of Switzerland is covered with forests, lakes, and mountains. One of the best places to visit in Switzerland, Zurich is the largest town in the country, and also the global centre for banking and finance. It is very attractive with its bounty of museums, art galleries and boating. Lucerne is one of the prettiest cities that boast 14th-century Chapel Bridge and Water Tower whereas Geneva is known for its fine-trimmed parks. These quaint cities have a very romantic and old-world charm to them making them perfect for a truly romantic honeymoon. Switzerland tour packages take you on a whirlwind ride to these charming towns and cities, to make your honeymoon very special. Adventure seekers can visit the towns of Zermatt and Lausanne in the country for they are famous for challenging hikes and steep ski slopes. At 10,000 feet, Mount Titlis is the loftiest mountain in the country, the peaks of which can be closely seen through a cable-car ride. The cable-car ride is one of the best things to do in Switzerland. Switzerland tourism has always been a top contender as a popular honeymoon destination and on the international honeymoon package lists! And its popularity has been ever increasing due to the stunning natural beauty of this place. Your Switzerland trip is incomplete without enjoying their famous cheeses and chocolates. The best time to visit Switzerland is in the summers when you can enjoy the panoramic views of the flora and greenery and the different festivals of the region. In the winters, you can enjoy snow sports like the skiing, snowboarding and ice skating. It depends on what kind of experience you are looking for in your honeymoon to this honeymoon heaven. Enjoy a memorable honeymoon in this charming country with Switzerland Packages. Browse through our other honeymoon packages in India, we also offer Kashmir Honeymoon Packages, Shimla Honeymoon Packages, Ooty Honeymoon Packages, Andaman Honeymoon Packages and also to other handpicked international honeymoon destinations such as Bali Honeymoon Packages, Europe Honeymoon Packages, Maldives Honeymoon Packages, Switzerland Honeymoon Packages and Dubai Honeymoon Packages. SOTC helps you to plan for a perfect honeymoon spot and have an incredibly memorable experience with your better half. Explore the blissful Bora Bora, renew your marriage vows in the city of love, Paris, or take a charming gondola ride with your beloved at Venice. Choose from a variety SOTC’s honeymoon packages. 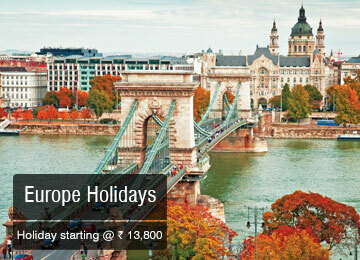 Also, check out our exclusive International tour packages to explore the best places around the globe! Don’t miss the different flavoured cheese and the delicious chocolates. You can even shop to carry them home. Switzerland is a cold country. Carry sufficient woollens irrespective of the time you plan to visit. Exploring the country on trains is perfect. They offer very scenic rides and it is a very romantic experience. Explore the beautiful villages of Switzerland. The real beauty lies there.